Rajinikanth Film Review From Thalapathy. Thalapathy Movie. Rajini Film Thalapathy. Rajinikanth Thalapathy movie. www.rajinikanth.com. "Thalapathy" is a story about a village hero (Rajnikanth) who has 2 brothers and a sister and a happy family. Ravichandran and K.R.Vatsala are his parents. "Vedavalli" (Soundharya) is the daughter of Jaisankar and 'Venniraadai' Nirmala. Nirmala is Ravichandran's sister and they all come to Ravichandran's home for Rajni's sister's wedding. That gives the opportunity for Soundharya and Rajnikanth to fight first, then to kiss and fall in love with each other. What happens next is the main part of the story. Rajni tries hard to spend his money and many times, the money comes back! He spends on Horse races, lottery tickets, makes a movie with Senthil as the hero and he even starts his own political party with Janakaraj being the candidate. All these events are good opportunities for situation comedies. Does Rajni win this competition? Does he get all the 3000 Crore rupees for himself and live happily ever after? (see it in silver screen!) is the rest of the story. The first half of the movie is an original Tamil story. The second half of the story has been lifted from the English movie "Brewster's Millions" (with Richard Pryor in the lead role). I saw "Brewster's Millions" just before watching Thalapathy. See the bottom of this review for my "Review of Brewster's Millions" . Eventhough the story has been borrowed, it has been modified well to suit the Tamil culture and audience. Super Star Rajnikanth satisfies all the requirements of Rajni fans - style, acting, good dance movements, fights and comedy. What more can one ask for? 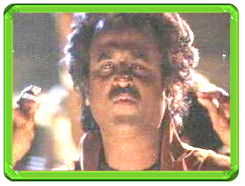 As usual Rajni's comedy acting is enjoyable. Particularly his comedy with Ssenthil is Superb. His love scenes with Soundarya is very interesting. Soundarya is not only beautiful, but she also acts well. Her love scenes with Rajni is worth mentioning again. Senthil deserves a special mention for his decent comedy. On several scenes, he is really funny. Janakaraj has been given a good role after a long time. He has done it well too. Vadivukarasi has done a totally different role in a super way.